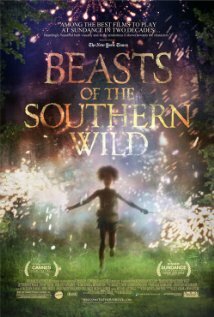 Beasts of the Southern Wild (2012), PG-13, 93 minutes - I had first heard of this film last summer while listening to the Out Now with Aaron and Abe podcast. They were quite taken by this little indie film and their discussion piqued my curiosity. Unfortunately there was only one theater in my area that screened it (The Grandin) and it was only there for a very limited time. I missed it on the big screen and was relegated to waiting for its blu-ray/dvd release. Yesterday, three days after it received four Oscar nominations, and after months of waiting, I was finally able to watch Beasts of the Southern Wild. This film takes a unique look at life in a southern Delta community known as The Bathtub - an impoverished area located below the flood plain and cut off from the rest of the world by a levee. What makes it so unique is the vantage point from which the story is told: that of a six year old girl named Hushpuppy who lives in The Bathtub with her father. Her narration repeats to us the stories she has been taught both at home and at school and how they relate to her experiences living in The Bathtub. For example, she was taught that everything in the universe works together and by breaking one thing, you can mess everything up. Or, similarly that by fixing one thing, you can fix everything. She is told of an ancient beast known as the aurochs that represents the epitome of strength and perseverance. Her father Wink provides shelter and food and a glacial sized portion of tough love. He tries to toughen Hushpuppy up so that one day she can fend for herself when he's gone. What he doesn't realize is that that time is coming sooner than he would have thought. His health is deteriorating and takes a turn for the worse just as a massive storm hits, flooding The Bathtub and causing many of its residents to evacuate. Wink and Hushpuppy along with a few other stubborn Bathtub residents refuse to leave their homes and vow to overcome the hardships brought on by the storm, even after they are forced to evacuate. Hushpuppy is played by newcomer Quvenzhané Wallis, who became the youngest actress ever nominated in the Best Actress category at the Oscars. Her performance really is extraordinary. You truly get the feeling that this six year old girl, because of her upbringing and determination, really could be 'The King of The Bathtub' as her father tells her she will become. She is self sufficient enough to make you think that she may be alright when everything is over, but also makes some mistakes that cause you to you wonder. Wink is portrayed by Dwight Henry, who gives a fairly strong performance in his own right. Wink's parenting methods are questionable and at times are downright neglectful but there is no question that he loves Hushpuppy and only wants her to be able to succeed in life despite the harsh realities of The Bathtub. Beasts of the Southern Wild is a wonderful mix of reality and the fantastical. Hushpuppy's story really is heartwarming as we see this little girl prevail over real life issues that no one, not even adults, should have to face. Time will only tell if Beasts of the Southern Wild will prove victorious in any of its Oscar categories (Best Picture, Best Actress, Best Achievement in Directing - Benh Zeitlin, and Best Writing - Screenplay Based on Material Previously Produced or Published), but it is always good to see an indie film like this recognized by the Academy. It is a unique film that is well worth giving a watch. If I had seen it even 24 hours earlier, it would have easily found a spot on my Top 10 Films of 2012 list.